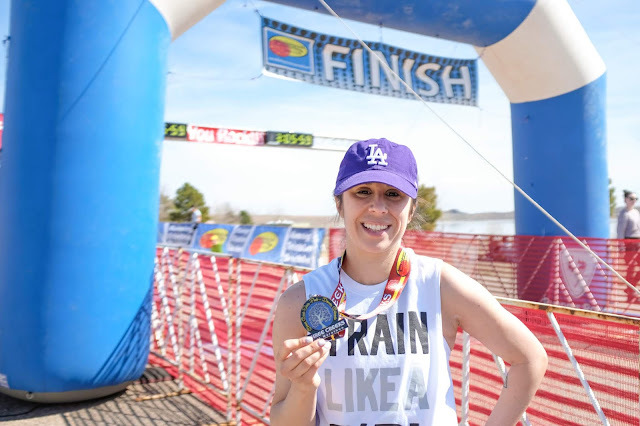 Megan Elvrum: How I Completed My 1st REAL Half Marathon!!! How I Completed My 1st REAL Half Marathon!!! I had been training since Thanksgiving 2018. 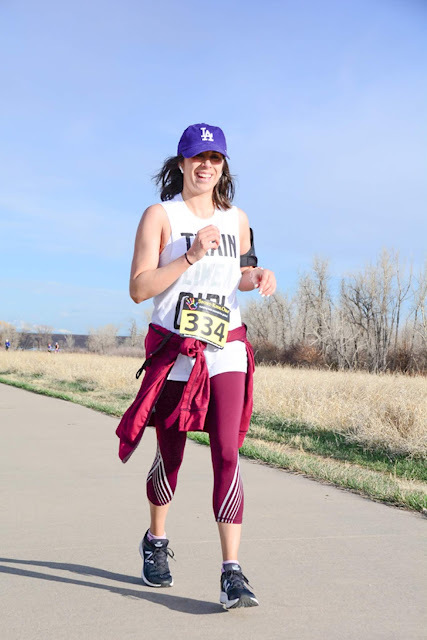 Come March 3rd, I was suppose to run my first half marathon, but Denver had different plans. A blizzard hit the night before and I woke up the morning of to 1 degree temps. So I opted to do a virtual run instead. Then began quickly looking for another half marathon. 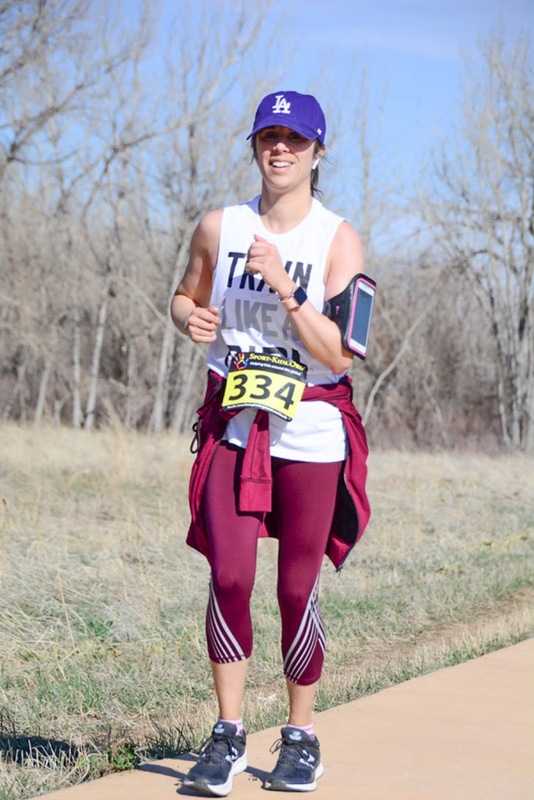 Enter the Three Creeks Half Marathon. Same place as where the previous one was to be held, four weeks later...WAY better weather! 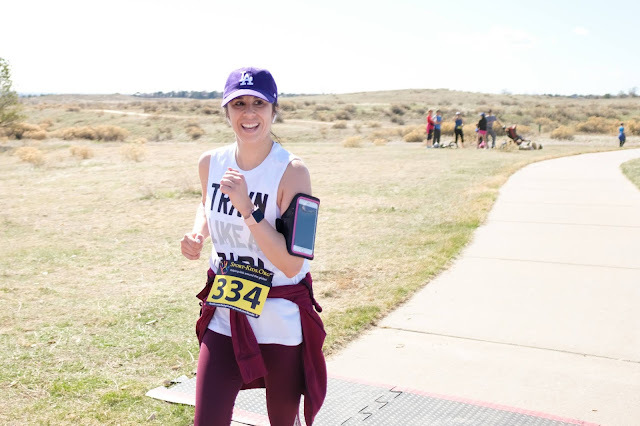 Of course, my taper was a month long but I managed to get in a 10 mile run the week before my half and it felt great, so I thought I was ready! The night before, I came home from work made a healthy meal (no pasta this time! ), had everything laid out for the morning, even my breakfast! Did pre-sleep prep (face washing, totally did my hair! LOL want to look cute for those race photos!) and off to bed right at 9PM! Wake up call 5:30AM. I had a good, but restless sleep, popped up in the morning ready to go. Everything was feeling great. I arrived pretty early to the race, had time to eat my English Muffin with peanut butter while walking to the start, pick up my bib, check my bag and hit the Porto Potty! Still feeling great! When the time came, I lined up behind the 2:30 pacers, excited to beat my previous time of 2:27. I was doing OK until about mile 2.5 when we began to run on a trail. 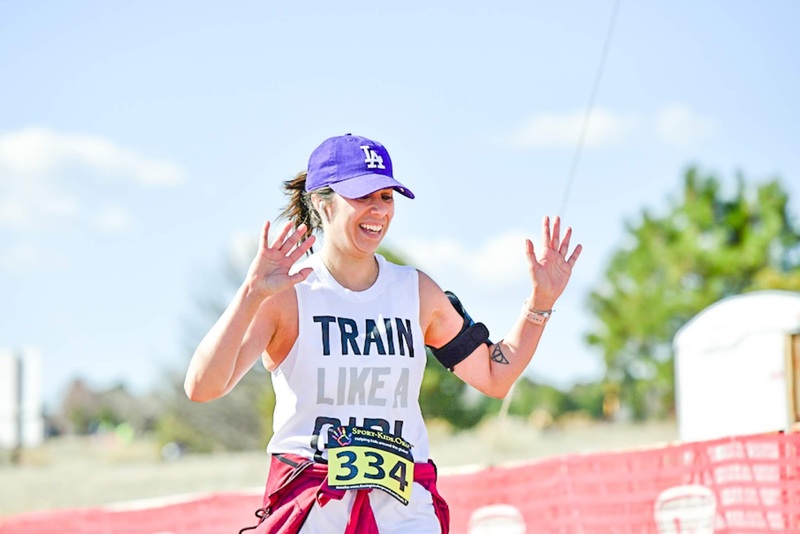 I had no idea in my head that there would be trail running, that was difficult. But all the way up until 10K I felt really great. I stopped at every water station and had my jelly beans at mile 5. Come mile 8 a huge incline arose. I had a tiny rock in my shoe and I had the beginnings of a blister forming on the right side of my big toe. I had only stopped to walk up the last 1/4 of the hill and when I saw another, I decided to asses the situation. Then I remembered that I had double knotted my shoes for the first time, so I continued on. Around mile 12 was more hills and more walking. From there on I was really hot, probably over heated and exhausted. It had grown to over 60 degrees at this point and I was running only on an extinguished English Muffin and a handful of jelly beans. When the last water station came up, I guzzled it in one gulp. At the final mile, people who had already finished the race were passing in the opposite direction to leave. That made me feel down on myself for walking so I tried my best to run up the last incline as best I could. Then FINALLY I could see the finish line. I knew Ocean Eyes and his parents would be there and it was all down hill from here. So once the last corner was in site, I gave it all I had. I spotted them right away, they cheered for me and I wanted to sob! I was coming in to the finish all alone and the announcer said my name and how it was my first half marathon I was so happy to be done. I almost missed the finish line photographer but we smiled and made eye contact at the last minute. Then it is all a blur...I hugged Ocean Eyes and his parents and downed some pancakes. We walked back to the cars and I hardly remember driving home. I right away drew an epson salt bath while Ocean Eyes made me lunch and then I fell right to sleep after eating my lunch! Even now, Tuesday, I am still sore! LOL I wouldn't change anything and I'm so glad I pushed myself through. 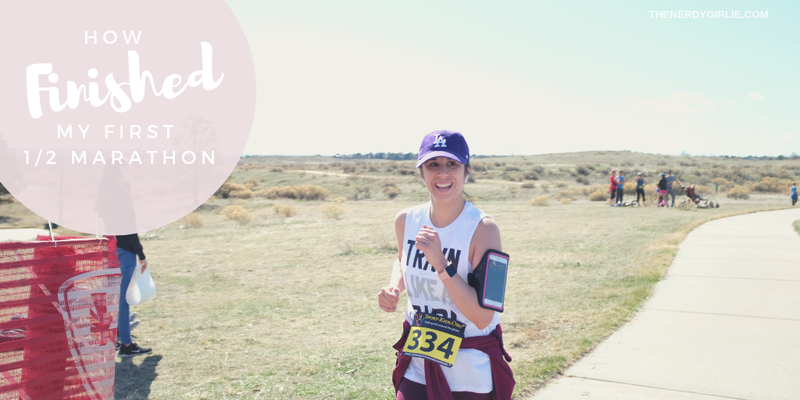 I'm not sure I'll do another half marathon, but I do want to keep running in my life! If you have a half marathon story, I'd love to hear it! 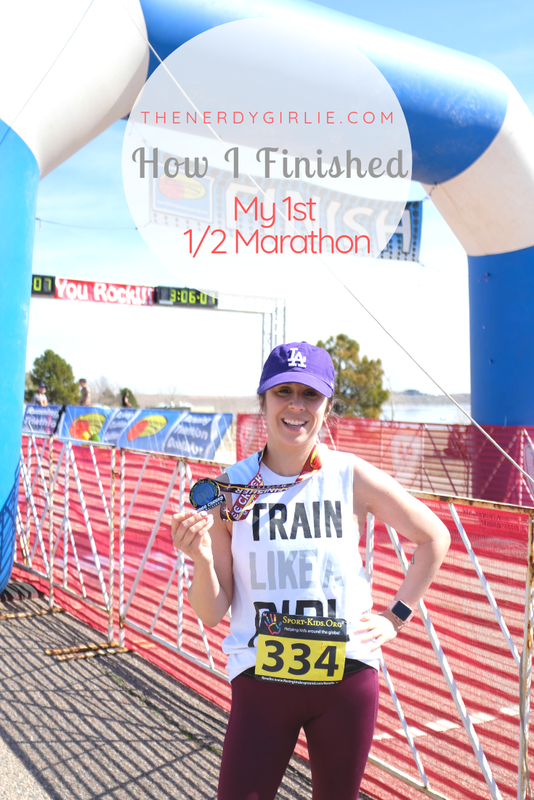 Did you say you'd never do another and totally get back on the half marathon train?! Let me know in the comments below! I feel like dressing for a race is ALWAYS the hardest part. I've learned that I get hot easily. So I try to wear pants that have mesh! It helps a little bit and I need all the help I can get. Congrats on finishing!